Plant names can be confusing to both new and old gardeners. A while back, a garden center customer kept referring to all of our hydrangeas as "macrophylla". Hydrangea macrophylla is the name for a particular species of Hydrangea commonly called "Big Leaf" hydrangea. And as you may have noticed when visiting your local garden center, there are many different species of Hydrangea. 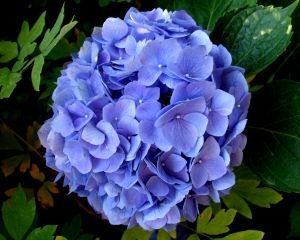 Hydrangea macrophylla is an example of a binomial name, often called the Latin name because they are usually written in Latin and have two parts. The use of Latin, which only recently is being made optional, comes from Latin being the lingua vitae, the language of life. Latin was used in the scientific world because it was regarded as a universal language. Over the years, many non-Latin words have crept into the naming system, so most names today bear only a superficial resemblance to classical Latin. Our example of Hydrangea actually comes from a combination of Greek and Latin terms- the Greek hydr and Latin angea, itself being derived from the Greek. It refers to the cup-shaped seed vessel of the plant. The introduction of the binomial naming system is credited to Carl Linnaeus, a Swedish botanist. His work Species Plantarum in 1753 is universally accepted as the starting point of the modern plant identification system. The first part is always the Genus name and the second the species name, these two are the important ones. You will often find them followed by a cultivar or variety name also, but not necessarily. You may even see it described as a "PG" or "PeeGee" incorrectly. (PG stands for paniculata grandiflora, another similar but distinct species). Other times you will see plants described using regional or common names, or even part of the Latin name that has been adopted through wide use as the common name, that are easier for consumers to remember. These will often include the name of the seed company, the name of the discoverer, or where it was discovered. If, for instance, you tried to look for Phaseolus vulgaris as named by Linnaeus, in a seed catalog or your garden center, you would not get very far. But if you asked for green, string, bush, navy, or pole beans, you would find them readily.